The ResortQuest at Poipu Kai is a condominium resort complex on 70 acres of beautifully landscaped grounds in the sunny Poipu area of Kauai. Brennecke's and Shipwreck Beach are just a short stroll away along garden paths through the resort.Guest accommodations are located in five individual communities each with its own character and style. All guest suites are decorated with tropical furnishings and fabrics reflecting the relaxed island lifestyle of their owners. 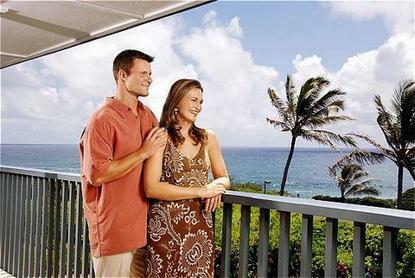 These spacious upscale condominiums feature fully equipped kitchens and private lanais. Daily maid service is, of course, provided.The resort offers many recreational facilities including six swimming pools and two jet spas that service each community for greater privacy, nine tennis courts and a jogging/walking trail. Great shopping, great restaurants and great sightseeing are all nearby.At the ResortQuest at Poipu Kai we are ready to say "E Komo Mai" - come in and welcome. *** HAWAII*S NON-SMOKING LAW ***In the interest of the good health of all our guests,employees and owners, and in compliance with the StateLaw Act 295, ALL ResortQuest Hawaii hotels and condominiumunits managed by ResortQuest Hawaii are now designatedas Non-Smoking Accommodations effective immediately.